What if there were a social media platform specifically for small business owners? There is and “Small Business Stacey” shares how you can leverage Alignable to grow your business. How would you like to have a tool that gives you more customers, more clients, more patients, while at the same time, building relationships and connections within your community? That’s what I’m gonna be sharing with you today. You see, I’ve always practiced and preached that there is no B to B marketing, there’s no B to C marketing. The only marketing that matters is H to H marketing. Human to Human. People do business with people. And wouldn’t it be great if there were a social media platform that allowed you to leverage that? Well, there is. And today I’m going to be sharing that tool with you. It’s called Alignable. See my shirt? I love Alignable. This is a great social media tool for small business owners, especially those who focus on a local area. You see, most social media platforms, they have sort of their typical stereotype. You know Facebook is known for focusing on friends and family and sharing what you’re doing and LinkedIn is like the business professional place. They all have their stereotypes. And up until recently, there wasn’t really one for small business owners to collaborate and network and work together in their communities. Well now there is and it’s called Alignable. I’m gonna do a demo today and show you how you can leverage this powerful tool. So bear with me for a moment while I share my screen. Okay. So here is Alignable. You want to go to Alignable.com. It is completely free to join, so absolutely no reason you should not get yourself set up on this amazing platform. I’m gonna give you sort of the quick and dirty overview and then go real in depth on you would get yourself set up. So when you log into Alignable, you get a timeline that kind of shows you what’s going on in your area. So this will show me some new businesses that are in my area that I could connect with and then every once in a while, they throw out a poll to get a sense of what’s going on with small business owners. And here’s some new businesses that we can recommend and connect with. So a timeline is sort of your daily check in to see what’s going on. On the left-hand side is my profile and how I have 243 connections and if I want to add more, I can click Grow my Network. I’ll go through that in a minute. So across the top, you have My Network, which are the people with whom are in different … people who are pending, people who I can connect with in various ways and I’ll go through this again more in-depth in a minute. There’s My Community which shows you what’s happening in my area. I’m in Bethesda. There’s a Q and A forum which is a great place to go to ask questions, get feedback and you can do that in all different areas. Different categories. And then there’s Messages. So this is sort of a new feature that they’ve added. The little chat functionality and you can have great ongoing conversations within the Alignable platform. And then you aways have Notifications so that every time you check in, you can see the newest and greatest things happening. So, the whole point of Alignable is to meet and greet and connect and refer word of mouth marketing on a local basis. And you leverage this through your profile. So when you first set up yourself in Alignable, you’re gonna need to set up your profile and this is the most important thing. So I’m gonna go to mine and show you how you want to set up a good profile. You want to make sure that you have an image on the top, not some boring, gray box that’s sitting there. And I actually am a Premium member. It’s completely free to join Alignable, but they do have a paid option called Premium that will allow you some additional functionality, which I’ll explain in a little moment. So you can determine if that’s good for you or not. As you scroll down, this actually, the Referral Dashboard is a Premium function. I’ll come back to that in a minute. To set up your profile, you’re gonna put in who your ideal customer is, what types of customer types you focus on and who’s a good customer for you. Because this will help other businesses then refer business to you. You want to make sure your About Us is set up. So tell the world, tell small business owners around you what you do and who you serve. And what your brilliance is. Tell them your story. How you got started. And the products and services that you offer. Further down your profile, as you start engaging and networking with people, they’ll recommend you and so already have 41 recommendations. And so you can see who’s recommended you and other people who have liked that. You can share your recommendations, you can save them, you can forward them. These are really powerful because this helps you get some SEO juice and love. So obviously people want to do business with those who other people love doing business with as well. So as you build out your profile on Alignable, make sure that you’re getting some recommendations that will really help you a lot. One feature that I really like about Alignable is you can post your products, your services, your events. So anything that you’re doing that you want to get the word out in your community and or to those in your Alignable timeline, that you’re connected with, post … They call it a product. Go ahead and post a product. So I have listed here some of my different programs. You can get a free marketing plan, you can get a copy of my book or the Action Marketing Training Program. And actually, usually every Free Training Friday, I’ll add that as a product in here because once you do that, it automatically gets pushed out to your entire network. And then people can like it, they can share it. It’s a great way to get quick and easy visibility for what you’re doing. And then I talked about the recommendations earlier, these are recommendations that I’ve given. Okay? It shows you some of the answers in the Q and A like when you go into this Q and A forum here, I’m very active on this because I really like to help small business owners and when they ask questions about marketing, I go in there and I answer. So I could comment, like, forward and share that as well. So a lot going on on your profile. You know, when somebody comes here, this is a great way for them to get a sense of who you are, where you’re located, what you do and who you serve. Now on the Premium level, you get some additional features. So you get some really good data. Some metrics that show you how many people have referred to you and who they are, which is really powerful. How many people have visited me. How many impressions am I getting? How many have seen my posts on the Q and A forum? So if I click View Activity here, I get even more granular data. So over the past 90 days, I can see that Dawn liked my service. This was actually what I did last week for Free Training Friday, the 10 day marketing campaign. So she liked it. Now what I can do is I can actually just click here to message her and thank her for liking it and follow up with her, see what she learned and if I can help her at all. And then John Floyd liked my recommendation, but I’m not yet connected with him. So if I click Connect, I really like the way Alignable does it. It makes it really easy to give a reason why you want to connect. So you can say, I know them, we refer business to each other, want to learn about their business. And then you can reach out to them. So this is a really great way to understand who is checking you out and give a reason then to follow up. So for example, 331 people visited and it tells you what they visited. Somebody visited my event to Groupon or not. And then I can literally go see who that is. Now, this was an anonymous person, so that’s probably not going to be of interest to me. But I can see 280 people checked out my profile. Hmm … well, who are they? And I can see specific people. So David checked me out. Well, I should message him and start a conversation right? So it’s a great way to connect in a non-pushy salesy way, but just to build relationships and connections. It’s really powerful on a local basis because of think of how you could partner with the other small business owners in your area. Maybe you collaborate and put on an event, or maybe you help promote somebody else’s event or program or service and they will then do the same to you. Because if you’re focusing locally, this gives you visibility to a much broader audience. That’s what I love about Alilgnable. Their name really says it all. They basically align you with those in your community. Social media and the Internet haven’t changed our capacity for social interaction any more than the Internet has changed our ability to be in love or our basic propensity to violence, because those are such fundamental human attributes. So let me see, where … There’s so much in here, I don’t want to completely overwhelm you. But there’s this toolbar across the top that gives you additional, deep dive searches. Again, the main thing is to get your profile set up because you want to look good to your fellow small business owners and those who are gonna check you out online. So once you get your profile set up, then you’re gonna want to send out some invitations to connect and you do that through My Network. If you’re just getting started, Alignable will actually give you some suggested suggestions of businesses in your area that you can connect with. You can also click Help my Network, or sometimes it will say Grow my Network. And when you do that, you’ll actually … Okay, here. Grow my Network. It’s supposed to pull up a box where you can then upload the emails of people let’s say in your contact list, which will then invite them and send them all a connection request. If they’re not an Alignable member, it will send them an invitation. And if they are, they’ll have the opportunity to connect. So let’s say I have some pending connections here, let’s see. Jeff wants to connect with me, he’s a consultant to small business. Sure. I’d love to connect So I’m gonna say accept. And then once you do that, it says “Congratulations, you’re connected.” And then I have the opportunity to send Jeff a message. So I could say, “Hey, let’s meet up and get a cup of coffee.” I could say, “I’ll stop by for a visit.” Or I could just say, “Hi.” And there’s some suggested wording here, but you can absolutely change the message. But I really like how Alignable gives you some suggested wording there to help get you started. And then you send the message. Then what will happen is Jeff will have a message in his Alignable platform and you grow the connection from there. Here’s the Grow your Network. Okay so you put in the email and if I do … I’m not gonna pull this up because I don’t want it to go through all my emails, but it gives you different options to upload people from your list. As I said, Alignable will also help you find other businesses to connect with. They suggest different businesses that are in your area. You can focus on those who are nearby. So if you’re very locally oriented, you could focus on that. You could focus on a category, a specific type of business and that will actually match up, when you set up your profile, when you kind of put in who’s a good customer for you, it will pull those into the category-specific recommendations. And then as new businesses come in, you can invite those as well. So this a great way to say, “Hey, welcome to the area.” Or “Congratulations on your business, let’s meet and talk about how we can work together.” All right. So that’s how you build up your connections. In the Q and A forum, this is a great way to … you can ask any kind of question here and when you click Get Answers, it will post this in the feed. And here’s my … I have a specific feed focused on marketing types of things. And then I can see what’s going on in this. So here’s one. Do B to B companies still send out holiday cards? And you can see that 750 people saw this, 25 people liked it and 15 people commented. If I wanted to … I can see all 15 comments on it. They actually, based on the likes and stuff, Alignable pops to the top, the most liked answer. But you can also see everybody else’s comments below in the feed. And if you want to add your personal take, you just type it in and click Post Answer. You can focus on local in this area as well. So what’s going on in Bethesda right? So while is the general Q and A, this is more locally focused. Alignable also has a blog, so there’s always great content being posted, they have feature articles, they showcase the top questions, what’s going on in small business. So there’s just a wealth of information in here all focused specifically on small business and to help you. Under Brand Ratings, you can get some input on some of the tools that a lot of small business owners use and you know, as I’m always preaching, it’s all about social proof. It’s not what you say about yourself that matters, it’s what others say about you that matters. So they have what’s called a trust rating. So if you’re thinking of some product or service, specific to small business, here you can see what other small businesses are saying about it. So these are very highly ranked solutions, good for small business. So then you could go and check them out. What I’d like to do is go back to … to show you again, how to send out something to your network. So if you remember, I told you this is going to be under your profile, so when you log in you’ll go to your profile. And then you will scroll down and you will add a product. Okay? So you can add an image, give it a name, give it a description and when you click the Create button, not only does it add it to your profile, but it sends it out to everybody that you’re connected with. And then they can like it, share it, give you a recommendation. This is really powerful. Another new feature they came out with is the Referral Card. So remember I talked about getting referrals? You refer other people and they refer you as well? So this is a great way to take sort of like your business card, they call it a referral card and you can send it to somebody. So you could send it to your current customers, clients or patients or even another business owner who you know on Alignable. And you can ask them to refer you okay? So this really helps build up that local word of mouth opportunity. All right. What I want you to know about Alignable is, it’s just a tool. And you’re gonna get out of it what you put into it right? So you can’t just like put up a profile and think that “Build it and they will come.” Because that’s just not going to work. Hold on one second. So I want to check in with the people on the line here and see if there are any questions. I’m wondering if anybody on here is already using Alignable and what you think about it. I’d love to hear your feedback. Let me check in with you. And it doesn’t look like we have any specific questions about it. So step number one is go out to Alignable. Sign up for free Alignable.com. Set up your profile and connect with me, Small Business Stacey. I would love to connect with you and help you on this platform. 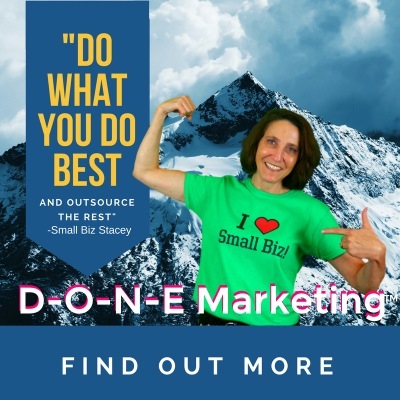 This is Small Business Stacey, your Small Biz Marketing Specialist, here to help you get your marketing into action and help you become a Small Biz Marketing Whiz.